For repairing your tubular, tubeless and standard clincher tyres and tubes, our range of repair kits is sensibly priced- meaning you'll be able to keep your treasured tyres rolling for longer; with the minimum of expense. Velox is the world's leading brand in tyre and tube puncture repair kits, and we are proud to genuinely endorse their quality products. Tubeless tyre foam insert and valve set designed specifically for carbon and alloy rims. Comes with Extremely lightweight Carbonaria 35mm tubelss valves. Pair of foam tubless tyre inserts, variuos size options. 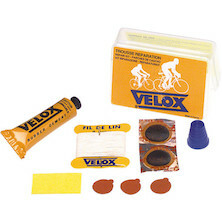 Get your tubular tires back to action after a flat tire with this kit from Velox.